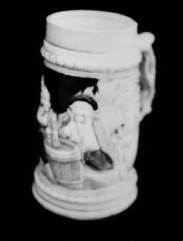 (326) Figural Ceramic Beer Stein.-Condition: Excellent Beautiful Ceramic Beer Stein that stands 7" tall. The stein is glazed with different shades of brown. The Handle is formed as a knarled tree trunk. There are 3 men sitting around a beer barrel in front of a cabin. There is a banner that says " Wet Froh aup Eyden lebenwill". Another Banner says "Der trinnt sein Biet Schweigest" This Stein was made in Japan. It is a beautiful piece of ceramic work and would add to any decorative stein collection. Price: $8.00 + shipping.